With the rainy drizzly January about to turn into a probably similar February it doesn't take long for my brain to wander to sunnier climes. Especially when asked to create a recipe inspired by Tenerife. I'm fed up with winter food so jumped at the chance to whip up something a bit sunnier in my kitchen. Tenerife is known for its cheeses, seafood, light stews and broths and grilled meats. 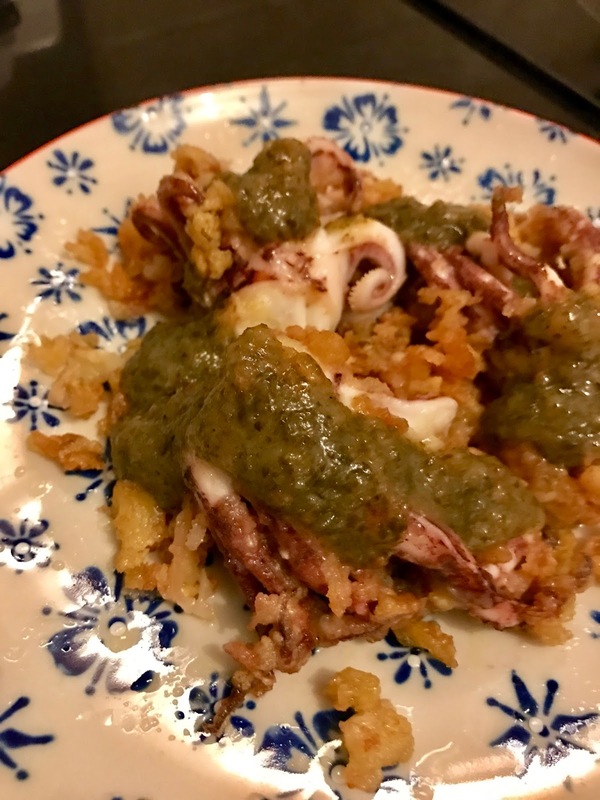 There was just one recipe I really wanted to make though - delicious lightly fried baby squid with the tangy, herby, vinegary mojo verde sauce. The slight crunch of the squid batter encasing the soft squid dunked in the sauce is pretty much all I'd want to eat if I was sitting in the Tenerife sunshine right now. Start by making the mojo verde sauce, as the squid takes minutes to prep and cook. Roughly chop the herbs and smash or crush the garlic cloves. Add them all to the blender with the chilli, salt and cumin and a splash of oil. Blend, adding oil as you go until you having a liquid paste. Stir in the sherry vinegar. Whisk the egg white in a bowl and put the flour in another bowl. Heat the oil in a frying pan. Dunk each piece of squid in the egg then the flour, then into the hot pan. Cook for 1 minute on each side. Remove and pop the squid onto a piece of kitchen roll to absorb any excess oil. Serve the crispy squid with a big squeeze of lemon juice and the mojo verde sauce drizzled all over the top. Cold beer optional but advisable! 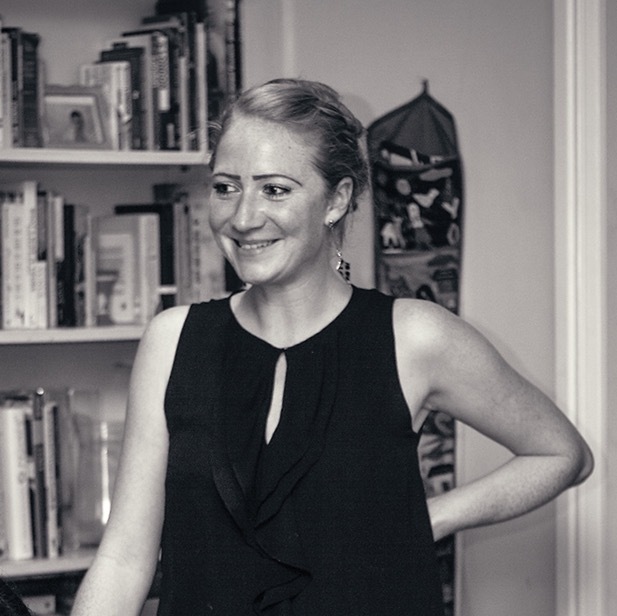 A couple of weeks ago I was out and about with Lucy when we saw a tweet from Giles Coren recommending a new restaurant that neither of us had heard of. His tweet was so convincing that we would've booked in regardless, but when we realised that this new restaurant was a five minute walk from where we live we phoned to book straight away. 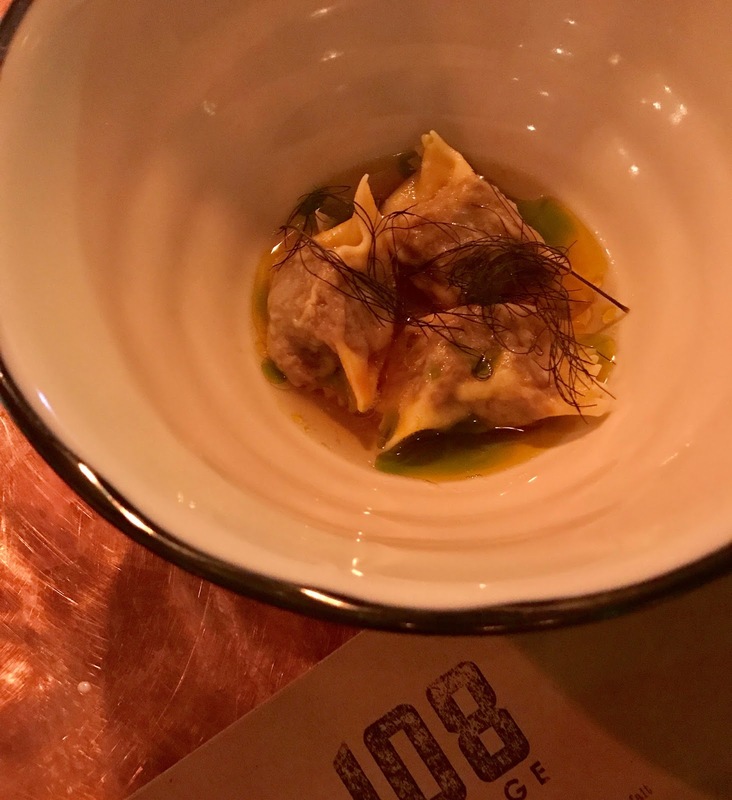 Last Thursday we headed down to 108 Garage, which by then had been reviewed by Fay Maschler, among others, to find out what all the fuss was about. 108 Garage is just that - an old garage on Goldbourne Road that now has restaurant seating in the front two things and an open kitchen with bar seating at the back which is where we were sitting. Seated up at the counter we got a great view into the kitchen and were able to chat to the chefs. 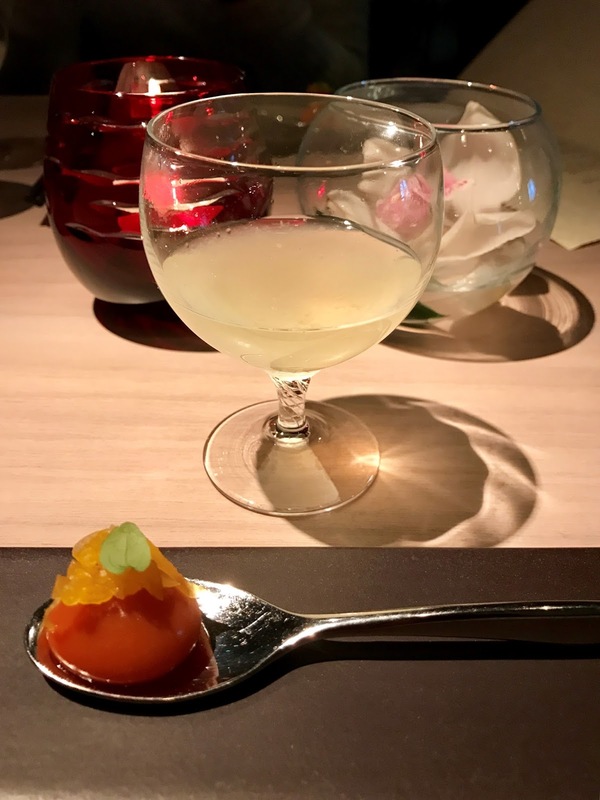 Before we'd even looked at the menu a complimentary basket of warm sourdough and pots of chicken liver parfait and tarama were passed over to us, as well little bowls of mackerel dashi broth. All absolutely delicious and a great sign of things to come. The bread and dips in particular were SO good that I could've eaten just those and left happy! Salty tarama mopped up with warm bread is one of my favourite things, and this was the best version I've had. We settled in with negronis while we chose our "proper" food and perused the wine menu. As usual we chose dishes to share, starting with lamb heart agnolotti, swede dashi and mustard oil, and roast octopus with golden turnip and tahini for starters. Both were excellent - the agnolotti was rich and meaty in the lightest of broths while the octopus was so tender and complimented perfectly by the crunch of the turnip. If you've been reading this blog long enough you'll know about my penchant for all things Japanese when it comes to food, particularly the raw varieties. I'm also a fan of the odd Deliveroo. Having just moved from south of the river to a more lively part of London my options of Deliveroo have tripled and now include a fair few restaurants where I eat out anyway. But they also include places I'd never heard of, with one particular place, Sushi Shop, making my ears prick up. Beautiful, bright photos of delicious looking sashimi, sushi, tartares, ceviches and pokes had me filling my basket and clicking order before I could even consider other options. And within half an hour or so, one of the most professional looking food delivery packages arrived at my door. 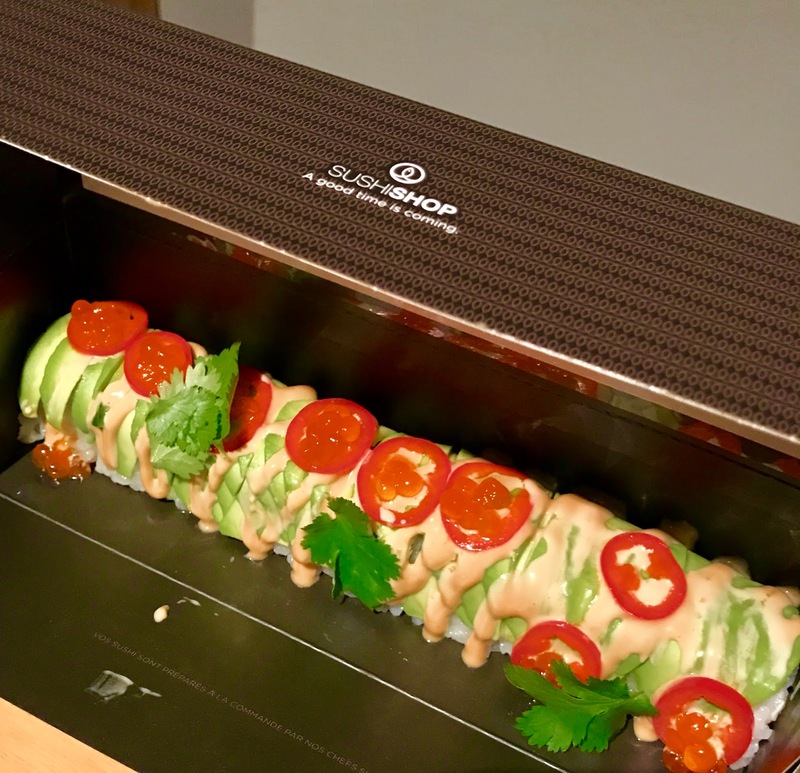 Fold out boxes opened to reveal perfect hand rolled and sliced deliciousness. January can be a gruelling month - whether it's because of a new diet, dry January, resolutions you're trying to stick to or the tightening of purse strings after the Christmas period it can all seem a bit bleak. But there's still plenty to celebrate, especially with Chinese New Year round the corner. And my favourite Chinese restaurant, HKK, have got a pretty spectacular menu running from now until 11th February, aka The Emperor's Feast - a ten course tasting menu, with paired alcoholic or non-alcoholic drinks. Before I go on, I have to say that this is pricey (£98 for food plus £58 for alcoholic drinks pairing or £28 for the non-alcoholic), there's no escaping that, but my plus one who came with me on the review (and has been on a lot of reviews with me) said she thought this was the best value meal we've been to - so you get what you pay for, which in this case is food, service and a restaurant worthy of the Michelin star it holds. So what do you get? The meal starts off with what they call a "punch". I've always classified punch as being a weaker kind of cocktail mix. Not this one! This one is made with Baijiu (a Chinese spirit coming in at 64% abv!) mixed with two types of rum (to dilute it!!) and lime.... It's punchy, warm and delicious and is served with a goji berry jelly that explodes in the mouth. My first brunch of two last weekend was much closer to home. Emily had invited me to join her at Kensington Palace which sounded very regal so I jumped at the chance. Fast forward a few whatsapps and we'd worked out it was D&D restaurant Kensington Place, not Palace, but having checked out their menu I was still super keen to go. Kensington Place is a lovely modern brasserie style restaurant that's been running for over 25 years and is attached to a small fish market just off Notting Hill. No surprise then that they specialise in fish and seafood. They do a great brunch deal - 2 courses at the menu price, with a £15 supplement for bottomless prosecco or Bloody Marys. 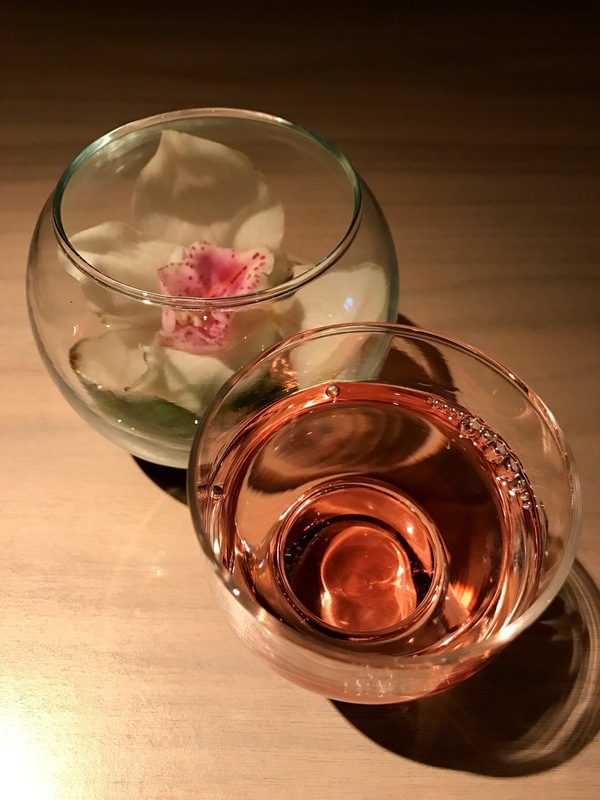 We settled in with a glass of prosecco while we tried to choose from the delicious sounding menu, which includes brunch dishes like eggs benedict; crispy squid with chilli and lime; flat iron steak, egg, chips and tomato chilli relish; and waffles with yoghurt and berries. With a weekend full of eating I went for the lighter option of oak smoked salmon, crushed avocado, poached egg, baby kale and charred dill and buckwheat toast. 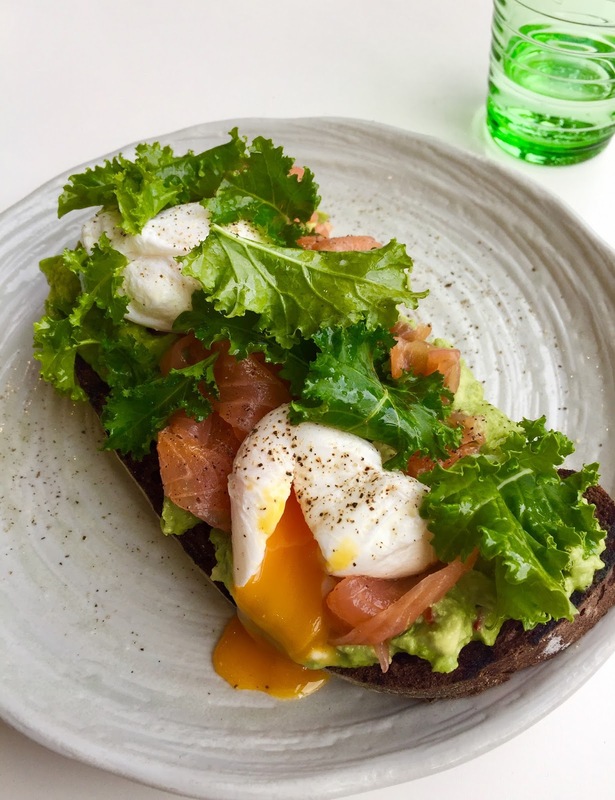 Perfectly poached eggs sat on wonderfully seasoned avocado and top quality smoked salmon. It was the perfect portion for me for brunch and all tasted so light and fresh and zingy. Two brunches in one weekend isn't something I normally do but last weekend was different. I basically ate my way through the entire weekend! My review of Saturday's brunch will be up soon, but I wanted to start with Sunday's brunch at Rotunda in Kings Cross. Rotunda is my kind of place. They really care about the provenance of the food they serve with their own farm in the Northumberland countryside supplying all the meat that's then dry aged in the restaurant's hanging room. 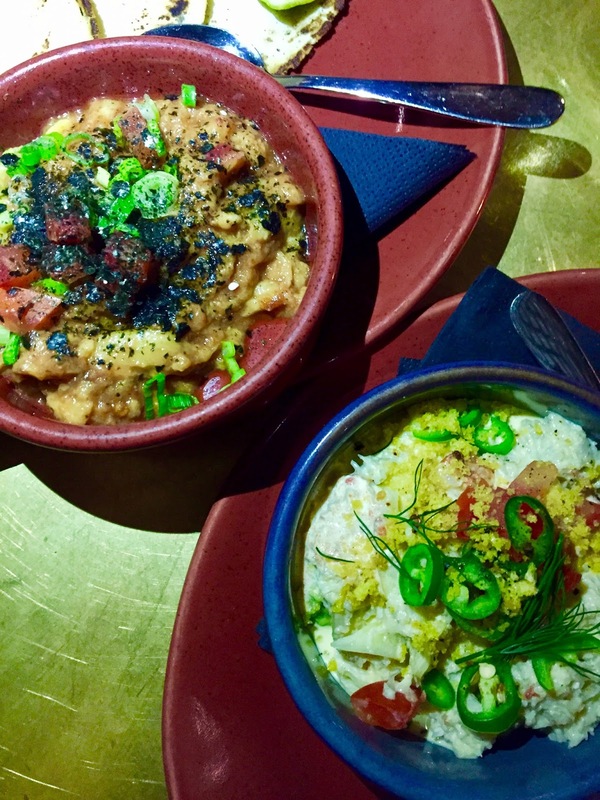 The menu is short and sweet, nothing is over complicated, there's a great drinks list, and it's right on the canal so you can sit and watch the world go by at a slightly slower pace than it normally does in Kings Cross. I met Michelle at the restaurant, when I finally found it - if you go, get down on to the canal by the walkway and it's easy from there! We went to check out brunch but in order to really check out their offerings I went for the brunch menu, which is served 11am - 3pm on Saturdays and Sundays, and Michelle had their roast. The brunch menu is excellent - there's something for everyone on there and for £26.95 you get one dish from the menu (which includes things like full English; Corneyside Farm 32 day aged steak with Clarence Court duck egg; Cornish crab with avocado, persimmon and buckwheat, and lots more choices) plus bottomless prosecco for 2 hours. 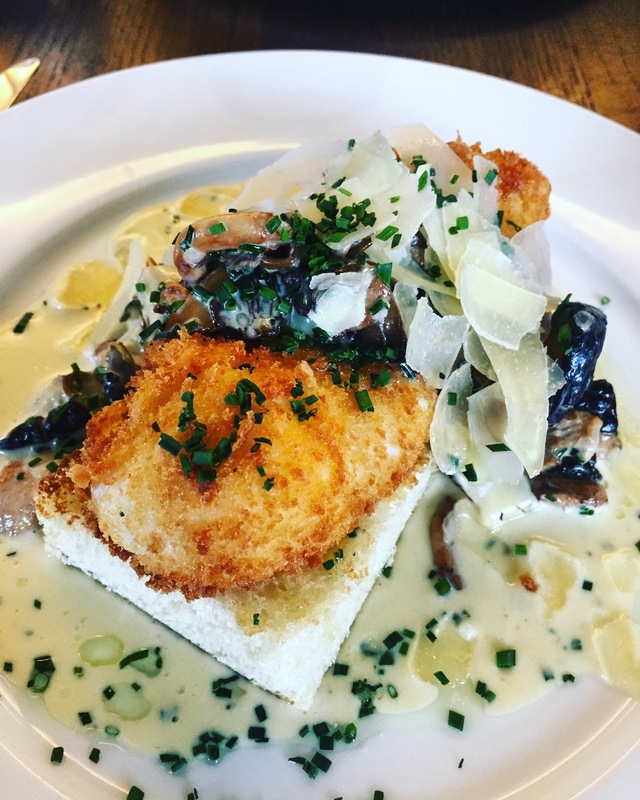 I had the poached then deep fried eggs on brioche with creamed wild mushrooms and Parmesan which was so rich and indulgent but absolutely delicious! It's once in not very often kind of dish for me personally, but absolutely worth making the trip to Rotunda for again. Washed down with a glass of prosecco it was really was dreamy. 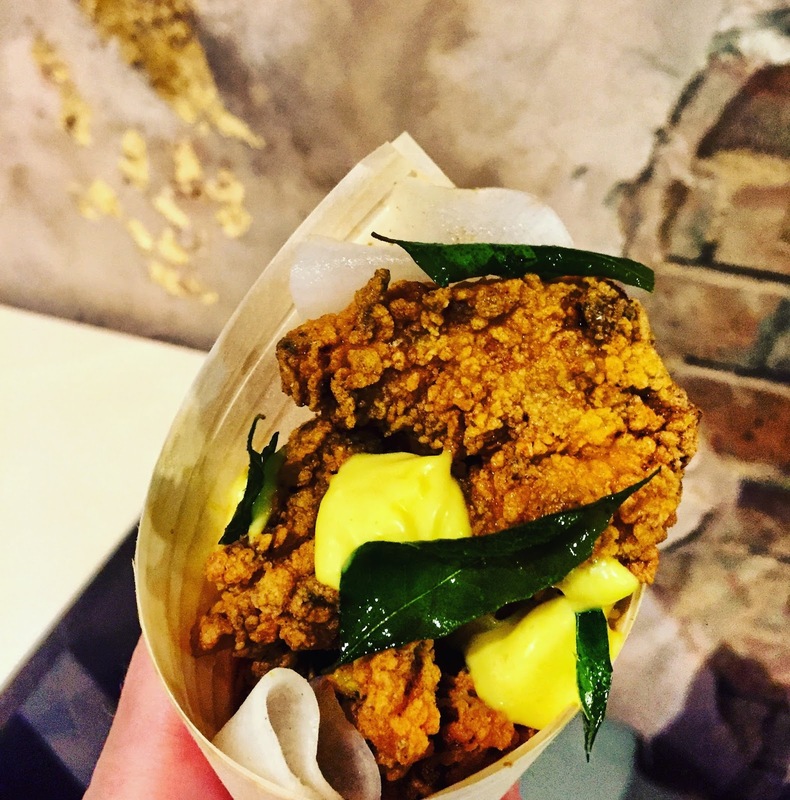 I don't normally go to a new restaurant three times before I review it but for one reason or another that's what happened with new meat joint Temper in Soho. No big deal, because I love it, so I'll be back many more times too! 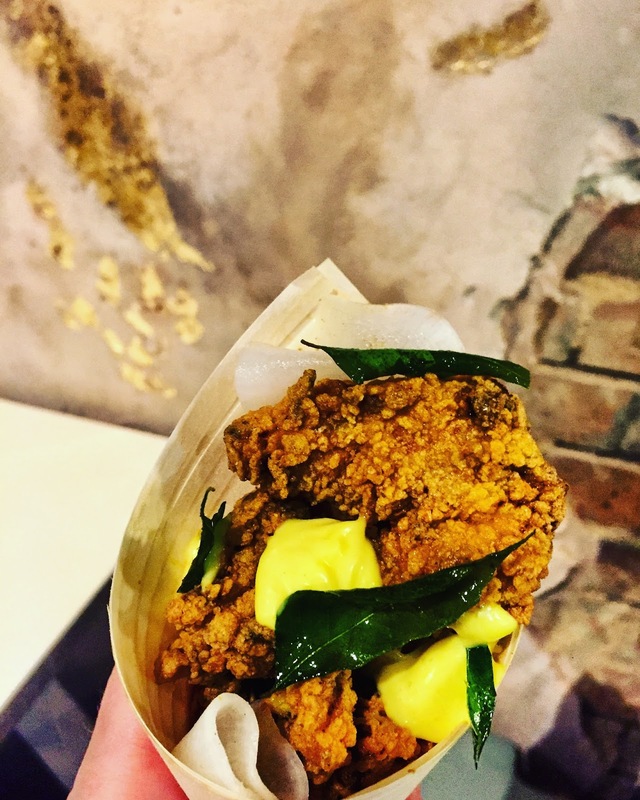 Temper is a massive and beautiful basement restaurant with booths, tables and 'at the counter' seats where you watch all the action in the kitchen in the middle of the room. And by action I mean the huge grills and barbecues where all the meat is smoked and cooked. The restaurant brings in whole carcasses, they butcher everything on site and even make their own tacos and flatbreads that all the delicious meats are served on. Having been three times now I think we've tried everything on the menu, which is split into tacos; chopped, smoked and grilled meat; sides/vegetables; sauces; and sprinkles. And it really is one of those restaurants where with a group of 4 or more (with appetites like me and my friends) you can work your way through the whole menu. My personal non-meat favourites from the tacos section are the aubergine and chipotle miso, and the crab and pickled onion pork skin, both of which come as build your own tacos. Ham Yard Hotel in Soho are hosting a brilliant Hot Gin Roof this January and February in collaboration with gin legends Sipsmith. I headed up to the hotel's rooftop last night to have a sneaky preview on what'll be on offer and if you're a fan of gin, hot cocktails and/or exclusive secret Soho rooftops then you definitely don't want to miss this! From 20th January to 16th February you can head up to the private roof terrace at Ham Yard Hotel to try the cocktails yourself. There's a welcome hot gin and tonic on arrival and then a hot gin cocktail of your choice to follow included in the ticket price, plus an intro by one of the Sipsmith distillery team. Which is pretty good for £18 a ticket - though book fast as I know quite a few dates have already sold out. 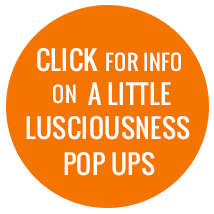 There are two sessions each evening - 6pm and 8pm (or just 6.30pm on Sundays). There's a huge range of original and re-imagined cocktails on offer. 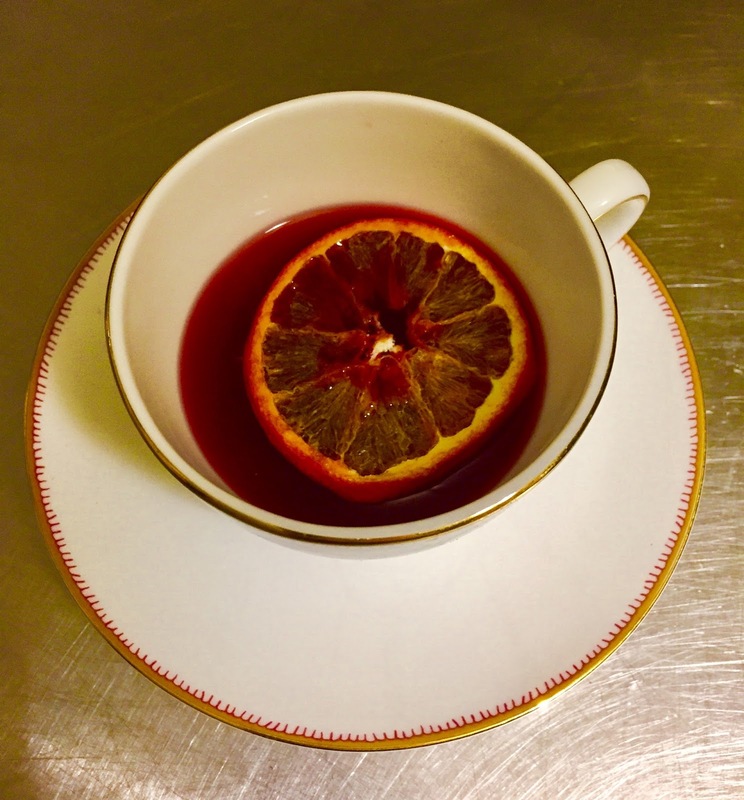 I tried a couple - the hot Negroni was perfect, made with Sipsmith London Dry Gin, Campari, Cocchi Vermouth di Torino and Red Berry tea, and served in a teacup. Equally as good was my Reverse Martini - a mix of Sipsmith London Dry Gin, vermouth mix, vermouth bitter and topped with a deep fried olive. Warm, punchy and delicious. 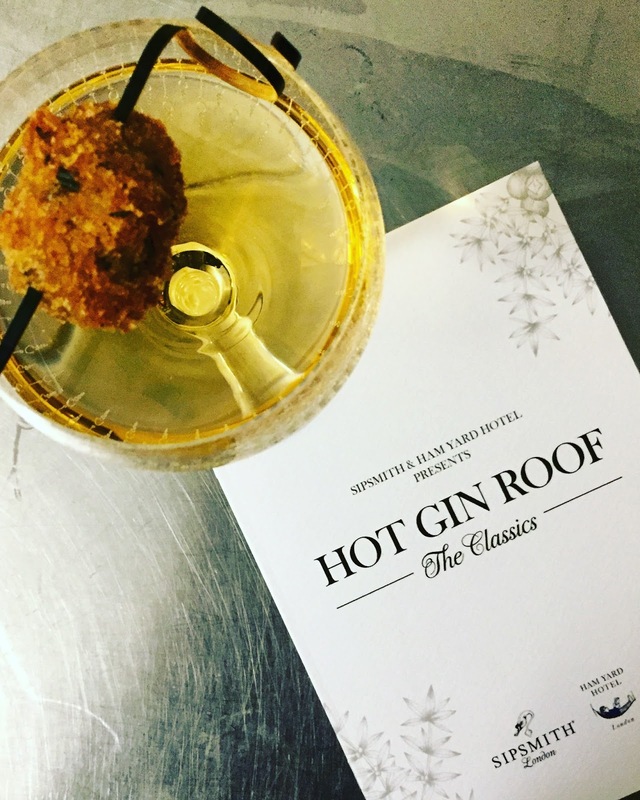 I went to Hot Gin Roof twice last year and had a great evening both times, so if it sounds like your thing then get booking now, and maybe see you there! I always find it funny how some of simplest homemade meals I post pictures of on Instagram garner the most attention and requests for recipes. This is something that took me 10 minutes to make, but actually, as it uses a cheap cut of meat and is on the healthy side of things, then maybe it's not a surprise that people want the recipe for this steak salad with salsa in January. Mix together the soy, oil, oregano and chilli and coat the meat in it. Leave for 10 minutes - 10 hours. The longer the better! Add all of the salsa ingredients to the magimix and roughly blend. Add a little water if it's too thick. Combine the mustard, salt, lemon and oil for the salad dressing in a jam jar and give it a good shake. Heat a frying pan on a high heat, and once almost smoking hot add the marinated bavette. Cook for 2-3 minutes on each side depending how thick the piece of meat is, then remove from the heat and leave to rest for 3 minutes. Slice into cm chunks. Toss the salad leaves in the dressing and arrange in a bowl with the meat on top. Add dollops of salsa and you're good to go! If you want to bulk it out a bit some boiled potatoes tossed in the salsa verde would be great. Over the last 18 months I've learnt so much about olive oil - how it's produced, the difference in production in different countries and the brands that make, market and sell it. This all started with my trip to Tuscany at the end of 2015, and continued when I went to Provence at the end of last year to spend time with Olivence - the Provence Olive Oil Society which looks after five of the top olive oil producers in France. While Provence is better known for its grape growing and wine production, there are actually around 100 olive varieties grown throughout the region and the area produces some of the world's rarest and most unique types of olive oil. The five premium olive oil brands that make up Olivence have come together to push a campaign to introduce their olive oils to the UK market, and to keep the olive growing traditions of Provence alive for future generations. All five of the brands create their olive oils on small scale production, with many of them still harvesting by hand and following traditional farming and production techniques. Our trip started with a visit to Vignolis, who are actually just outside Provence, in Rhone, in the gorgeous village of Vieux Nyons. They grow their own olives and make oil from their own harvest as well as other local farmers' harvests, producing 50% of PDO Nyons olive oil and olives. We had a wonderful olive based lunch (olive stuffed lamb, olive bread with tapenade, an olive ratatouille, spelt salad with olives and veggies) with the owners of Vignolis before touring their olive oil museum and factory, then tasting their olive oils, olives and wines. Parmigiano Reggiano is one of the world's oldest cheeses and has been produced in the same way for over nine centuries. 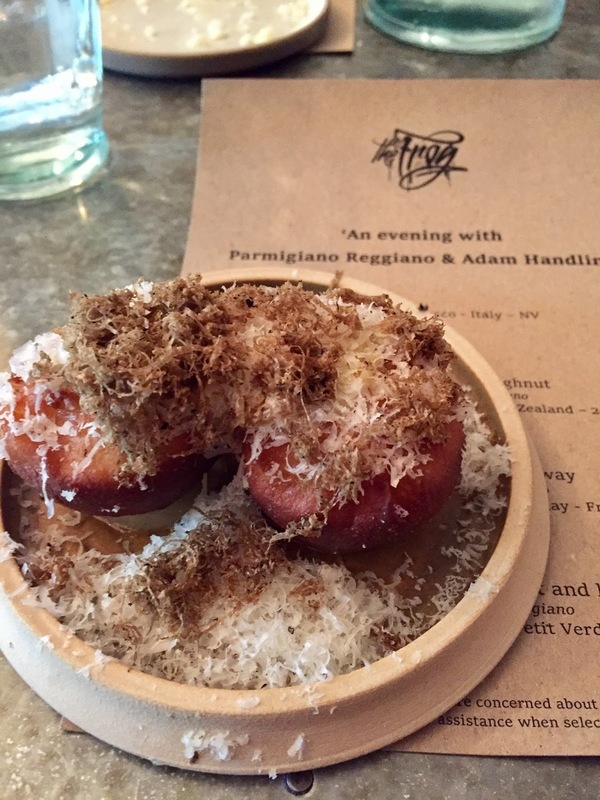 To celebrate this delicious product I was invited to Adam Handling's restaurant The Frog, near Brick Lane, for a three course meal created using Parmesan. Both the starter and main course we had are from The Frog's regular menu, so luckily you can try these yourselves. Our starter was cheese and truffle doughnuts, which you can barely see in the picture as they're hidden under a small fluffy mountain of grated 24 month aged Parmigiano Reggiano and black truffle. The doughnuts were sweet and light, and well complimented by the salty, rich cheese and earthy truffle.